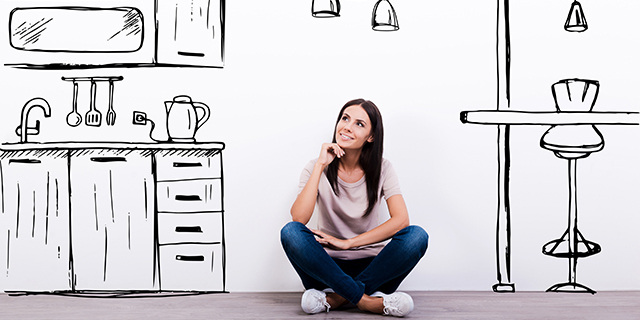 Even if you've never taken out a mortgage or bought a home before, you probably have some idea of what the process is like from watching others go through it, not to mention thoughts about what you want out of your future dream home. But new research shows that the home buying process and the decisions you make throughout it are trickier than you might think. NerdWallet's recent Home Buyer Reality Report, which surveyed more than 2,200 home buyers and mortgage applicants, found that many people—millennials included—are dealing with buyer's remorse. So what are their regrets? The biggest regret for millennials—given by 28 percent of the generation's respondents—was not saving up more money before buying a home. In fact, as far as finances go, despite 27 percent of buyers reporting that they believed they took out an affordable mortgage, 11 percent said they no longer felt financially secure after buying their home. Another portion of respondents regret decisions they made in terms of their home in its features: 19 percent of millennials said they wished they had bought a bigger home , while 12 percent said the features and amenities they had initially valued changed after they bought their home. And as far as preparedness goes, 15 percent of millennials said they would have done more research on the home-buying process, 14 percent said they would have better organized their paperwork, and 10 percent wished they'd waited longer to buy a home in the first place. In addition to their regrets, respondents also talked about the surprises that happened to them along the way. The report revealed that 19 percent of millennial homeowners were surprised at how long the process took, 15 percent were surprised by hidden fees that popped up, and 16 percent were surprised by how complex the whole process was. But overall, millennials were pretty evenly split on their opinions about the home-buying process itself. Forty-six percent said they thought it was stressful, 35 percent reported that it was complicated, and 30 percent said they felt intimidated. On the other hand, 37 percent said it was manageable, another 37 percent said it was rewarding, and 26 percent said it was actually enjoyable. The takeaways from this? If buying a home is what you want, expect the process to be confusing but rewarding. Also, try to think about every option you have in terms of what Future You will want, too. And be extra prepared—with your documents and finances in check, and ready for surprises as well.